The following is a guest post from Robert Widner is a prominent Dallas Texas attorney specializing in divorce cases. He has been part of “Divorce Rescue” live radio talk show on KLIF570 AM and has spent years working with counseling groups like Pathways, founded by Dr. Phil McGraw. He can be reached through his website, robertwidner.com, on Twitter or on LinkedIn. An interesting story is circulating from Texas. 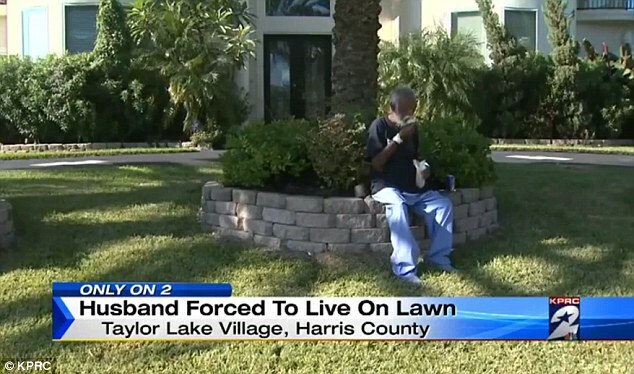 A 69-year-old man has been living on the front lawn of his million-dollar estate for the past six months. Reports indicate that Sharafat Khan and his wife have been married for more than 30 years, though a dispute over extended family left the sour. The man’s wife allegedly kicked him out, and took away his keys, but Mr. Kahn decided to stay. He claims that he shouldn’t be forced to leave, as the property is half his, and he doesn’t have the money to file for divorce. Signs hang all over the estate, warning neighbors not to give him food, though neighbors worry about his health, as he is elderly and suffers from medical conditions. Police say they’ve been called out 20-30 times over the past six months, but the man refuses help, and he isn’t doing anything unlawful. Realistically, there are likely very few married couples in which at least one party has wanted to relocate their spouse outside, though most of us don’t act on it. If you’re feeling tempted to oust your spouse, or it’s gotten so bad that you want to relocate yourself to the yard, there are ten things you should know. It doesn’t usually matter whose name is on the title. Most states give both parties equal access to the house, primarily because it’s joint property, but also because it’s the other party’s home. Just as you cannot kick a tenant out without going through the proper channels, you can’t lawfully kick your spouse out. The police will step in if there’s extenuating circumstances, like violence or threats, but that’s about it. If you’re in a position where you can’t afford another place to live, as the case might be with a stay-at-home parent, a lawyer may be able to request that the court award immediate funds or support to help during the transition. The court may also force one party to leave the residence, though this is usually only mandated in extreme circumstances. For example, in North Carolina, a married couple must be living apart for at least a year before the court will make decisions, unless one party has broken one of a handful of rules. Your plan to oust your spouse can backfire. Because it’s illegal to kick someone out of their home, you may face penalties, including temporary loss of the property. Divorce or separation is very difficult. There are a lot of emotions, and if you’re actively fighting with your spouse, spending some time apart may be beneficial. However, it should be addressed in a business-like way. If you can’t get your spouse to agree to leave for good, perhaps he or she will leave for a night, or will agree to counseling. Even if it’s clear that your marriage is over, getting counseling at the end may help ease the divorce process, or help the two of you learn how to get along well enough to parent together. Divorce isn’t always 50/50. Even without a prenuptial agreement, a judge may look at how one partner contributed to debt, and assign the debts to that party. In some states, like Arizona, the debt would be spilt equally regardless, if left up to the courts. If you stand to lose (and everyone does), it pays to be amicable. Your soon-to-be ex may agree to take on his or her own debts, in which case the courts will likely sign off on your agreement. There will also be other aspects that are better decided by the two of you than by the courts. Maybe you’d prefer to keep the retirement account, and let your spouse have the equity in the home. If you work together, these decisions can be made by the two of you, but you must be amicable from the start. Hopefully, a cooling-off period will allow you the opportunity to see eye-to-eye again. If not, divorce may be imminent, but regardless of the circumstances, it’s always best to try to be business-like from the start. I’m seriously laughing out loud, while not sure I understand. I`ve decided in the event my husband cheats on me, rather than get an expensive divorce I will require that his GF do all the work I don`t want to- like cook, clean, laundry, and all other duties associated with the house. Hopefully she will be young and energetic. There are societies built around just that concept. First Wife rules. All subsequent wives do the grunt work. I think #4, especially, would save a lot of problems, if people heeded the advice. Actually, I would enjoy camping out in front of my million dollar estate as well. Now, all I have to do is get a million dollar estate (sleeping bag ready). You and me, both. Especially in mild weather. You could do a lot worse. He looks rather comfortable. Like he’s camping or something. A friend used to always say that if his wife divorced him, he’d just move next door because he liked the neighborhood, but this guy is, well, comfortable. He does look comfortable. And he has all the space he needs, right?